This is a sketch of what I have professionally been involved with over the years. Throughout this time I have been working on a personal project which began when I first quit academia and went to study and work in Paris for twelve years. I have continued work on the project intermittently ever since. 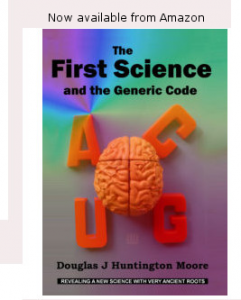 It culminates in my book The First Science and the Generic Code which I have just finished writing. The purpose of this page is to address a problem concerning the nature of the book. The book presents solutions to long standing problems in science, philosophy and the foundations of mathematics. Readers of the book may be left incredulous by the scope and depth of the overall approach. In a nutshell, the book is quite outrageous. However, this is not my fault; it is just that the Cosmos happens to be designed that way. I only tell the story. Unfortunately, there are many books and pamphlets out there making all sorts of nonsense and outrageous claims. My book is not one of those. However I must face the problem and so have to be careful that my Deep Reality work doesn’t get lost in the babble. But the story presented below may add more confusion than clarity. In 1975 an Australian academic in Electrical Engineering quits academia and heads for Paris with the declared intention of making Marxism scientific. And why not? That was the sort of thing you did in the seventies. Later there were venture capital adventures with start-up projects based on my computer languages. They were all very expensive financial flops involving millions of dollars. But finally, a later start-up was successful. It was launched with no venture capital at all. This was Fusion Sport and had nothing to do with my research interests either. But then, maybe it did. You see, I have always been interested in how something can be created out of nothing. And we did it! From the experience I learnt two things. Firstly, creating something out of nothing is not easy. Secondly, I have always been interested in the rationality of the self-fulfilling prophesy and how it works. People write about it for start-ups. The self-fulfilling prophecy is expressed in your Mission Statement. In reality it is much more complex than that. It is the consensus that the founders form right at the beginning. It is their vision of what the future for the company will be. It is an incredibly detailed view. What’s more, it kind of comes true, not according to plan, but according to the vision. The only thing that doesn’t work is the timeline. The timeline is always way out of whack. So there it is. Twelve years spent recycling my brain in Paris. Languages that code the universe, making something scientific, creating something from nothing and the rationality of the self-fulfilling hypothesis. What better background for writing a fundamental book on Deep Reality? The title of my Ph.D was “A Geometric Theory of Electrical Networks.” A classical problem at the time was to work out the necessary and sufficient conditions for an R network to be implemented with only positive resistors. This is a stronger condition than passivity which is easily characterised by a positive definite matrix. It is impossible to solve this classical problem using normal matrix methods as the references frames tangle up with the desired result. I got rid of reference frames by using Blumenthal’s Metric Geometry and proved that the geometric property of positive R networks was that, in the geometric representation, all the angles including the hyper angles were acute. I like geometric methods. I would probably have continued on in the geometry area if I had have known about David Hestenes work in Geometric Algebra (GA). Curiously, I was to come back to GA only over the last few years. One year sabbatical at University of Maryland. I had already developed some vague interest in Marx due to being radicalised by long campaigning against the Vietnam war in Australia but only had read Trotsky’s History of the Russian Revolution and some of Chomsky’s books. In the US I started seriously reading Marx after completing a Capital reading group directed by Paul Lodico from Washington State. By the end of the year I had read most of the Marxist classics and had started to grapple with Hegel in a terribly amateurish, and anguished way. I still retained my long interest in Charles Sanders Pierce though. I came back to my post at Newcastle university with a grand project in mind. To the astonishment of my department mates I invited them into my office and told them to help themselves to my wall of engineering books. I can’t explain it now, but I didn’t think twice about my decision. Somehow I had to do it and straight away. Within a week I would be on my way to Paris. It was Febuary 1975 and I was on my way to Paris but my young sister, Robyn, talked me into going via India which she knew very well. She drafted out an itinerary for me mainly concentrated in the South of India. It took me four months to complete but it was an experience which changes one forever. I even came across some communists in Cumbum, Tamil Nadu. I remember waking up in my hotel and seeing a bike flash past flying a huge red flag with hammer and sickle. I went out to buy a cigarette from a merchant in his typical one metre square stall on the side of the road. At the back of these stalls one usually sees framed pictures of the merchant’s favourite three gods. Vishnu, Shiva and Ganesh are typical. As I paid for my cigarette and lit it on the smouldering cotton cord provided, I noticed the three framed pictures at the back of his stall. In exactly the same pale pastel shades of the Hindu versions were Marx, Engels and Lenin! Later at dusk Iwent to the mass rally being organised on the hill. There the secretary general of the Tamil Nadu communist party was addressing the rally. The whole spectacle really looked like Jesus on the mount. The sun was setting and as the rally ended I was accosted by some party members. They thought I was a CIA agent. Eventually I ended up talking to the secretary general, a highly educated and cultured man. I told of my plans of making Marxism scientific and some of my ideas. He eventually shook his head, and turning to his comrades said “This man is not a CIA agent.”. This is just one of many stories in India. I’m sure everybody has their stories too. India does make a strong impression. It was in Paris that I started reading Vedanta philosophy, an essential ingredient of any one who delves into the delights of Deep Reality. Arrived in Paris and started learning French. Looked up the Marxist economist Jacque Valieire but didn’t continue meetings as the direction of my interests was fast changing. For the first six years in Paris, at the various universities and L’ Ecole des Hautes Etudes I studied semiotics, functional linguistics, structural linguistics, logic, philosophy, comparative religion. I attended lecture series by Michel Foucault, Francois Chatelet, Henri Martinet, Algirdas Greimas and others. 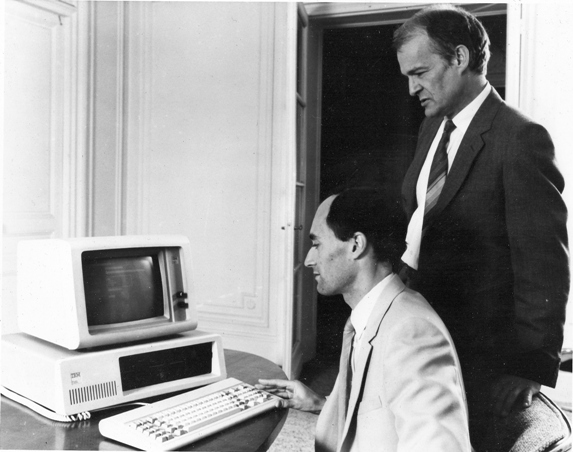 I also served on the presidential central committee for Computer Science and Society and chaired three sub committees. That was a most stimulating time. After six years, ran out of funds and had to work. Worked for Honeywell Bull and Bull Transac. In the latter case I was a consultant in the SMALLTALK language and object oriented programming. Eventually developed my own language MANA and received seed capital from FA Technologies in Paris. Later teamed up with Colin Bray to co-found the MANA project funded by SCIRAD. 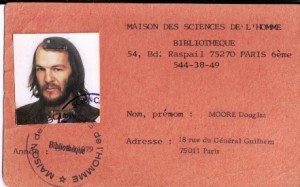 This was arranged in France but the project was carried out in Australia. The total budget for the project was six million dollars but the stock exchange collapse dried up the funding and 1.7 million was not enough to finish the project. After the collapse of SCIRAD I founded Gender Systems Pty. Ltd. I raised some more funds which was enough to get to a working prototype. We sold two copies and that was the end of Gender Systems. With both the MANA project with SCIRAD and Gender Systems I made just about every mistake in the book. At least with the SCIRAD formula all investors got their money back, but without interest. Gender Systems was a total loss. Douglas Joseph Huntington Moore. A Metaphysics nf the Computer: The reality machine and a new science for the holistic age.San Francisco. Calif : Mellen Research University Press, 1992. The Metaphysics of the Computer book difn’t go much further than a Greimas style semiotic square analysis of reality.When I once asked a French philosopher friend why Greimas didn’t get the attention I thought he deserved The answer was swift and simple. Il n’y a pas de sujet. His answer was to haunt me for many years. How does one abord the problem of a science of the subject? A consistent theme in the book was gender as a system construct. an idea dating from ancient times.The book explores the gender construct and is an attempt to understand it at the fundamental level. The work can be seen as an exploratory preparation for the real thing – my forthcoming The First Science book. We are now in the nineties. Scirad Fund Ltd. had collapsed. The Mana project had moved on to Gender Systems Pty Ltd, that I had set up with some more venture capital.Eventually that too went into liquidation. Time to return to academia. Back in academia. Wow! How the world has changed. Much more administration and red tape. I only took on one Phd student and that was in logical programming. I spent most of my time on Deep Reality stuff. 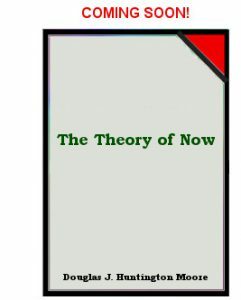 It started off as Totality Theory -a completely naive notion – and then it became generic science, which is more correct. Progress was slow and, in my opinion, the work was far too immature to publish. Generic science was far too risky to take on a graduate student at that stage. Also resumed research and development of MANA multi-paradigm language. In Generic Science I only need one publication to set the ball rolling and it may be necessary to bypass peer review. Either you have it or you don’t. Newton’s philosopher’s stone. There is no chipping away in this area. It is only in 2010 that I eventually arrived at a sufficiently mature science. This will be the new book. I developed an AI platform with artificial speech capability. Here we go again. I must be allergic to tenured academic positions. This time I’m off collaborating with an Israeli entrepreneur. It involved my multi-paradigm language, now baptised GAIA. The end result was an AI platform with speech synthesis and speech recognition. Did the work from Brisbane and commuted to Israel every few months. I met up with Marcus Deutsch, who has a Phd in Sports Science, and we founded Fusion Sport in 2003. 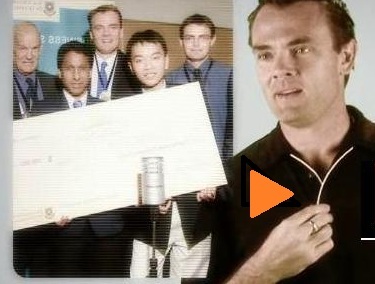 Later that year Fusion Sport won the $100,000 UQ Business School Enterprise Award . Five years later Marcus explains what followed. Click here to go to this MUST SEE VIDEO. Photo from Weekend Magazine “The fifty brightest and the best” series. Douglas Moore and Marcus Deutsch, the two founders of Fusion Sport. I have completed many software contracts for major companies over recent years including a two year contract with Telstra. Other companies include Transtol, QPS and Bradnams. Now the big one! I have finally finished writing the seminal work The First Science. These are very early publications when I was an academic for seven years. I then left academia and went to France. Most of my professional life has been outside of academia and so I haven’t published that much. I have been more interested in solving the big picture problem. Why bother digging up an old publication list? Frankly, I need some credibility. There are so many hair brained ideas out there that it is difficult to be taken seriously. This will change, but in the meantime … I did do some interesting things in the early years. Whilst my academic colleagues became more specialised over the years, I went in the opposite direction. A Geometric Theory for Electrical Networks – Theory and Applications, PhD Dissertation Monash University, Australia, August 1967. Transfer Impedances and the Non-Amplification Property of Resistive Networks, Proc. IEEE, Vol. 56, No. 6, June 1968, pp. 1116-1117, (with G.E. Sharpe)[online]. A Geometric Theory for Resistive Networks with Positive Element Values,Proceedings Hawaii International Conference on System Sciences, pp 246-250, Honolulu, Hawaii, January 1968. Conditions on the Inverse of the Admittasnce Matrix Y(s) = Cs + G, IEEE Transactions on Circuit Theory, Vol. CT-16, No. 2, May 1969, p. 246. Metric Transformation of an (n + 1) terminal Resistive Network into a Hyper Acute Angled simplex P, in Euclidean Space E. Proc. Eleventh Midwest, Symposium on Circuit Theory. pp. 184-191, University of Notre Dame, Notre Dame, Indiana May 1968. (with G.E. Sharpe). The Place of Metric Geometry in the teaching of Modern Circuit Theory, Proc. Asilomar Conference on Circuits and Systems, December 1969, pp. 401-4-6, (with G.E. Sharpe). A Geometric Theory for Transformerless RC Networks Leading to New Realization Conditions, Proc. Hawaii International Conference on System Sciences, January 1969, pp. 183-187. Application of Topological Methods to Resistive Network Inequalities. Australian Electronics Communications Proc. IREE pp 123-123, April 1968. A Theory of Visual Form, Proc Fourth Hawaii International Conference on Systems Sciences, 1971, pp 690-692. Pattern Recognition, Complexity and Illusions, Proc. Fourth Hawaii Inter-Conference on Systems Sciences, 1971, pp. 681-683, (with D.J. Parker). Parallel Processing: A Relationship Between Retinal and Fourier Optics Techniques, Proc. of Fourth Hawaii International Conference on Systems Sciences, 1971, pp. 152-154, (with P.J. Moylan and J.B. Moore). A New Approach to the Analysis of Pattern Discrimination in Terms of Chord Space Analysis, Pictorial Organization and Shape, J.F. O’Callaghan (editor), C.S.I.R.O. Computing Research, Canberra, May 1972, pp. 139-149, (with T.M. Caelli and J.A. Keats). A Gestalt Theory of Machine Perception, Pictorial Organization and Shape,Pictorial Organization and Shape, J.F. O’Callaghan (editor), C.S.I.R.O. Computing Research, Canberra,. pp. 109-117, (with R.A. Seidl). An approach to the Analysis and Extraction of Pattern Features Using Integral Geometry, IEEE Transactions on Systems, Man and Cybernetics, Vol. SMC-2, No. 1, January 1972, pp 97-102. Feature Extraction and Pattern Recognition, Pictorial Organization and Shape, J.F. O’Callaghan (editor), C.S.I.R.O. Computing Research, Canberra,. pp 59-70, (with D.J. Parker). Machine Perception, invited paper in Australian Telecommunications Research, Vol. 6, No. 1 , 1972, pp 3-12, (with D.J. Parker). A Geometric Theory of Visual Perception, Proc. Biologically Motivated Automata Theory Conference, pp. 26-29, IEEE New York 1974. Analysis of Global Pattern Features, p. 149-164, Pattern Recognition 1974 Vol. 6. A Configurational Theory of Visual Perception, p. 449-509, International Journal of Man Machine Studies (1975), Vol. 7. A New Approach to the Analysis of Pattern Discrimination in Terms of Chord Space Analysis, Technical Report Newcastle University No. EE-7104, Dept. of Elec. Eng., December 1971, 50 pp. (with D.J. Parker). On Topological Invariants of Patterns, Electrical Engineering Tech. Terport No. EE-6908, Newcastle University 1969. On the Application of Metric Geometry to the Synthesis of Resistive N-Ports,Electrical Engineering Tech. Report., No. EE-71 -, Newcastle University, 1971. A Theory of Monaural Sound Localization, University of Newcastle Technical Report No. EE-7308, August 1973. Douglas returned to academia for six years in the 90’s and published a number of conference papers in Computer Science. His amin interest however was in a new kind of Science called Generic Science. He only wrote up some technical reports on this work. Generic Science will stay in the shadows until publication of the First Science book.